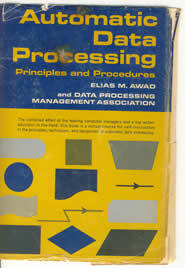 A colleague handed me a book that belongs to his father: Automatic Data Processing: Principles and Procedures by Elias Awad. It’s about data management circa 1966. Book cover: Automatic Data Processing: Principles and Procedures. Update: I will continue Coding related posts and articles on my other site. Fascinated, I borrowed the book and made some scans. It begins with an overview of historic data processing like Roman figure counting, Venetian bookkeeping and Pascal’s calculator. The majority of the book describes data theory and the modern methods of programming and processing data. The appendix covers Fortran and COBOL among others. What interested me the most was the chapters on punched cards — the two leading card types (Hollerith/IBM and Powers/Remington Rand), how they’re written, read, sorted and duplicated. I can imagine the game of 52-card pickup was not considered very fun in those days. Awad provides illustrations and photographs such as those below. An example of a punched card. 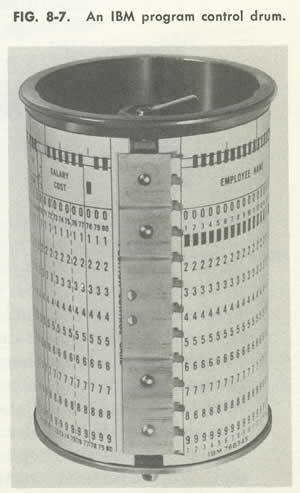 A photograph of an IBM control drum. 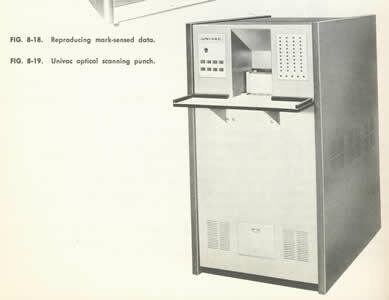 A photograph of a Univac optical scanning punch. Portion of a COBOL program sheet.